A report published Monday in the Eastern Economic Journal by researchers from the University of Miami found that a person’s grade-point average in high school not only indicates the person’s chances of getting into college and whether he or she will finish college or graduate school. It could also be an indicator of how much that person will earn later in life. 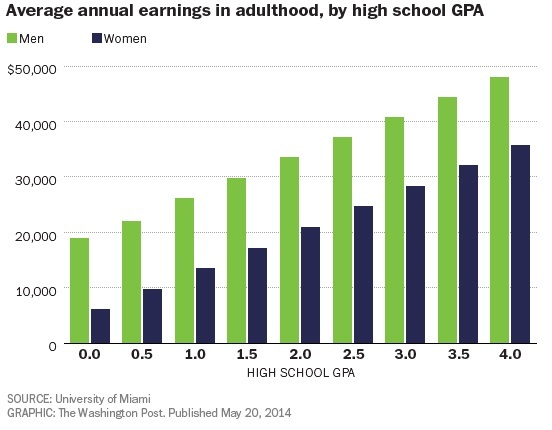 The team of University of Miami researchers found that a one-point increase in GPA means a 12 percent boost in earnings for men and a 14 percent boost for women. Even so, there’s a big gender gap in total earnings. A woman who got a 4.0 GPA in high school will only be worth about as much, income-wise, as a man who got a 2.0. A woman with a 2.0 average will make about as much as a man with a 0 GPA. The data also show that average high school GPAs are significantly higher for women, but men will still end up having significantly higher income later on. 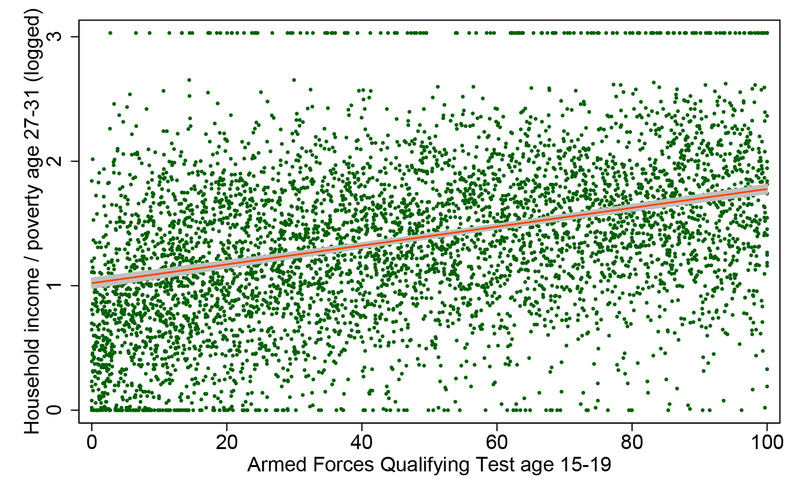 It also found that high school grades can indicate the likelihood of going to college, and that a one-point increase doubles the chances of completing a degree for both genders. Each dot is a person’s life—or two aspects of it, anyway—with the virtually infinite sources of variability that make up the wonder of social existence. All of a sudden that strong relationship doesn’t feel like something you can bank on with any given individual. Next Next post: Who’s To Blame For The VA Scandal?